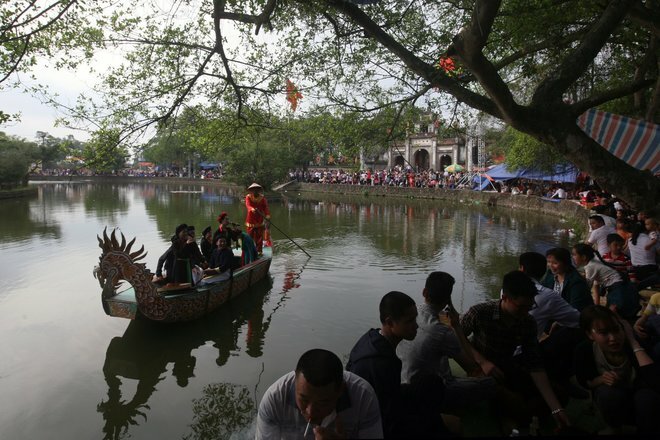 Cổ Loa Citadel (Vietnamese: Thành Cổ Loa) is a citadel built near Phong Khe, about 20 km to the North of today’s Hanoi, during the end of the Hồng Bàng Dynasty (about 257 BCE). The fortress is a spiral-shaped complex of the then new capital. Its name is derived from the Sino-Vietnamese, meaning “old spiral.” The site has been the source of various relics of the Dong Son culture of the Bronze Age. The story goes that when the city was first being built, the work done during the day was destroyed at night. The king made a sacrifice and that night a golden turtle came to him in a dream and told him that the king was building the city on the turtle’s carapace. Instead, the king was instructed to build the city in a new location – that of present day Co Loa. The king did so, and the city was soon finished. Out of gratefulness to the king, the magic turtle gave the king a claw that he could use as a trigger on his crossbow. When used, it multiplied its force by the thousands. However, one of the Qin dynasty leaders, Zhao Tuo, took advantage of the decline of the Qin and created his own kingdom north of Au Lac. He tried to conquer his southern neighbor but was defeated. Instead, he married his son to the daughter of the Thuc king. When the son was in Co Loa, he discovered the magic turtle’s claw and stole it. His father invaded the Au Lac and Co Loa and easily defeated it. Stories of the Thuc king’s demise vary. Some say he committed suicide by jumping in the ocean. Some say he was born off to sea by the magic turtle and never seen again. Some say he was told of his daughter’s betrayal by the magic turtle and killed his own daughter before he disappeared with the turtle. 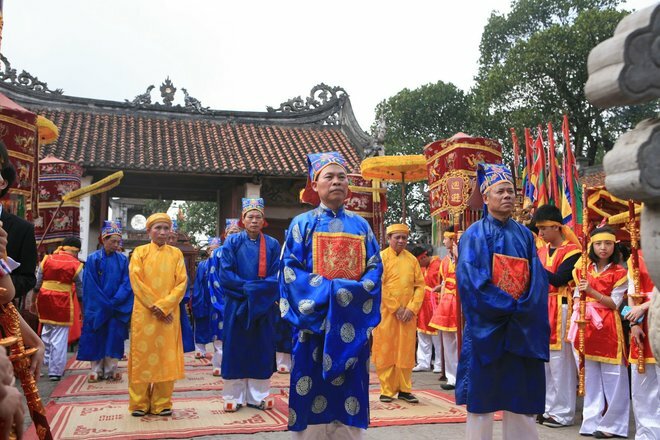 The Co Loa Festival is to commemorate and worship An Duong Vuong Thuc Phan for his legacies: the Kingdom of Au Lac and the Co Loa Citadel. H1: There is an old saying “When you die, you left everything. 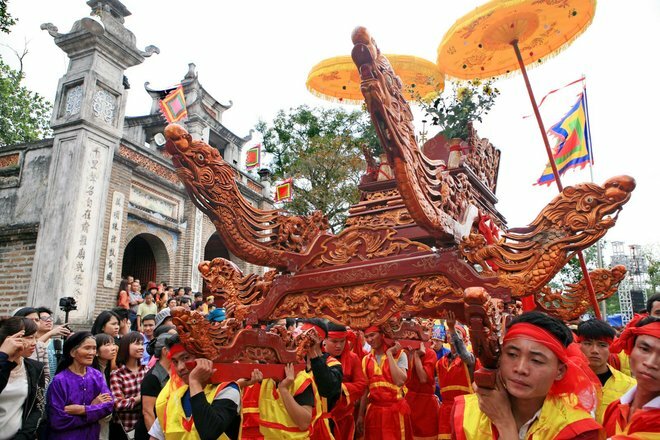 When you live, you do not leave the 6th of January.” The old saying implies the Co Loa Festival, the signature of Phong Khe. The festival starts on the 6th of January and ends on the 18th. 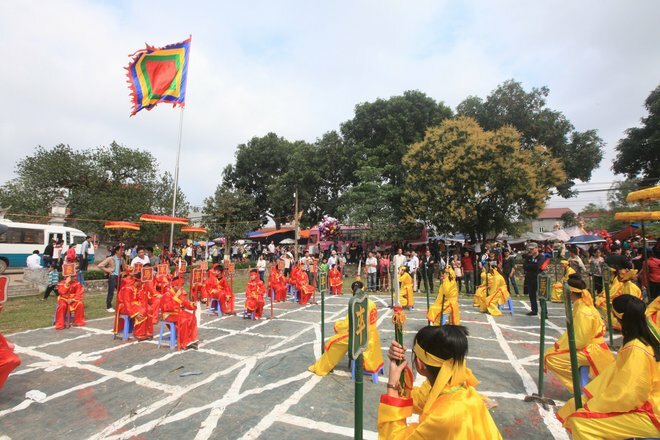 The festival was based on the An Duong Vuong’s customs, who feasted his troops on this day. To remember the founder, the people here celebrate the event every year with joy. 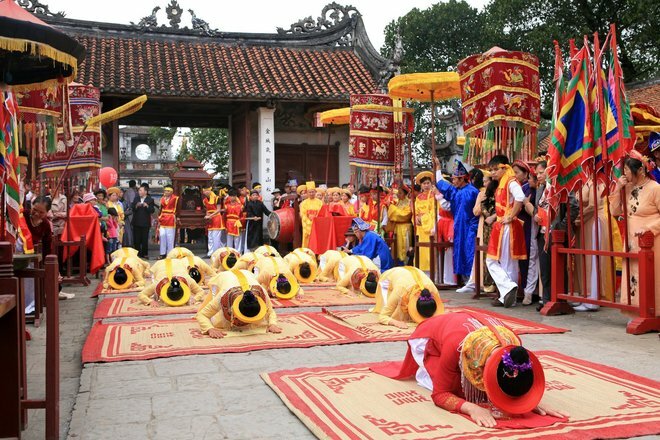 H2: On the day of Assembly, the festival began with great ritual and the ceremony procession. Ceremony was conducted in the atmosphere of music. In front of the line were the dignitaries, then the villagers took turns praying for peace and prosperity. 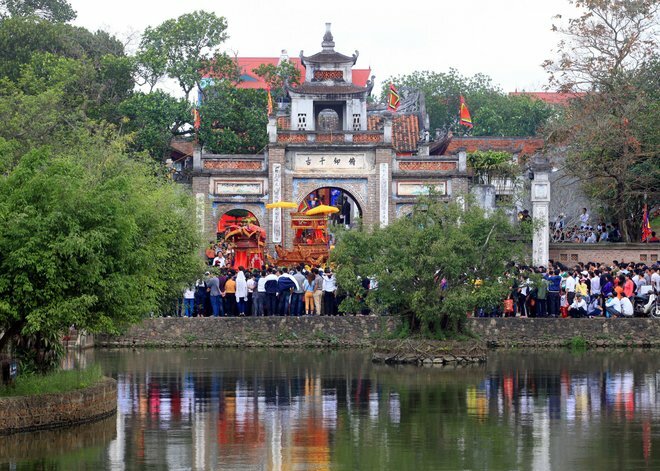 H3: Co Loa Village (Dong Anh district, Hanoi) consists of 12 neighborhoods but the festival is for 8 villages only including: Ðài Bi, Sàn Dã, Cầu Cả, Mạch Tràng, Văn Thượng, Thư Cưu, Cổ Loa, Xép. 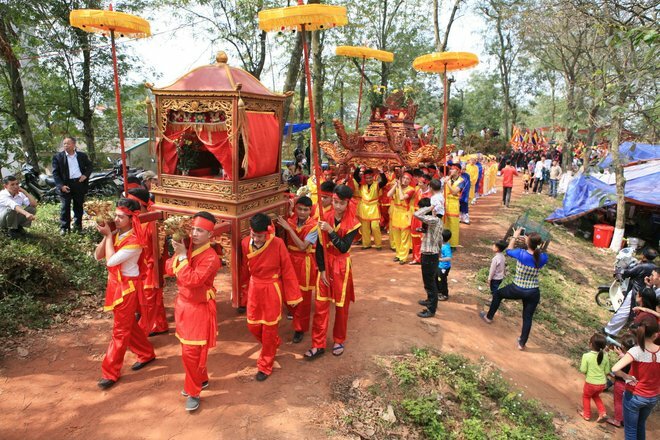 All villages worship the King Thuc Phan so they all participate in the festival. 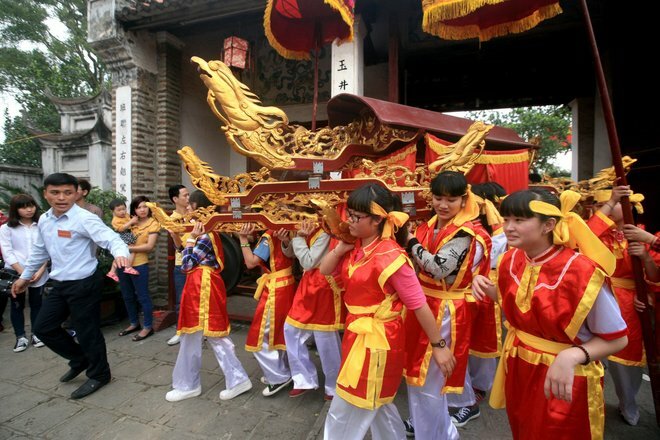 Here are the rituals of the eight villages. H4: From every corner, you can see people with flags, scepter, palankeen, uniform. H5: Leading the parade is the flags then the king’s emblem, than the eight treasures. Next are the tokens from the eight districts and the magistrates in traditional clothes with hats and the king’s weapons. 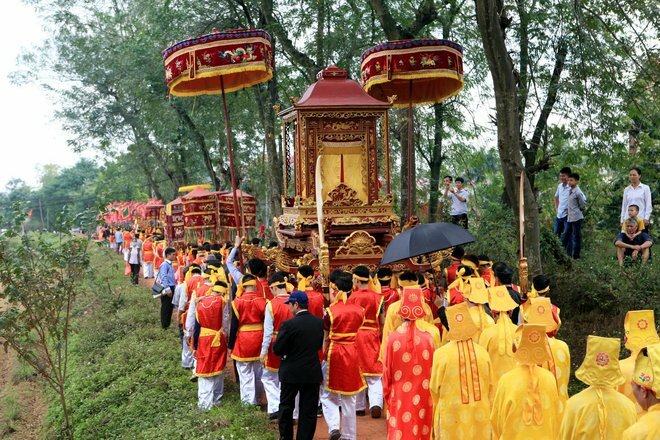 Following are the officials and the villages carrying the King’s throne. Finally are the representatives of the villages with their own flags, emblems. H6: My Chau’s palankeen is brought from the Co Loa Temple to the Upper Temple on the 5th. This presents the princess visits the king. 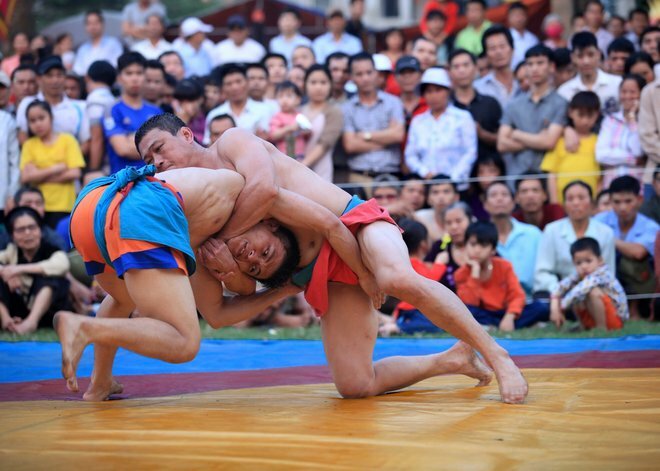 H9: Wrestling is always an exciting activity, especially for the young men in the area. H10: Traditional singing in front of the Upper Temple. 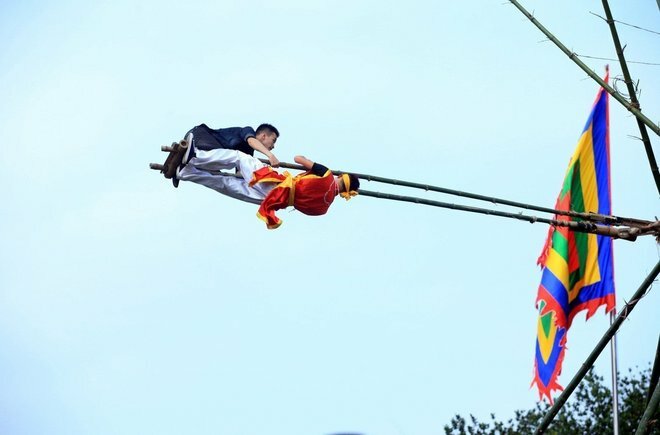 H11: The festivals not only attract the residents of the eight villages, but also many tourists from other areas, therefore, the festival is even more sensational.